As multiple murderer Katherine White is about to be executed, journalist Beth Chandler goes to her hometown of Oldfield, Illinois, to talk to her uncle, librarian Julian White. Julian tells Beth that it is the town’s evil that caused Katherine to kill. He tells several stories from its past to demonstrate his point. In the first story, mousy clerk Stanley Burnside finally plucks up the courage to ask out co-worker Grace Scott. When he is humiliatingly rejected, he responds by strangling her. His success gives him the impetus to kill his ill sister whom he must endlessly tend. In the second story, a wounded petty hood flees into the swamps where he is saved by a voodoo practitioner. Recovering, he finds that his rescuer has discovered an immortality serum and is over two hundred years old. In the third story, a carnival freak who specialises in eating metal and broken glass desires to leave the circus and be with his girlfriend but is reminded by the circus owner that she magically made him who he is and can cause him great pain. In the fourth story, a group of Confederate soldiers at the end of the Civil War come upon Oldfield, which has been razed by soldiers, leaving only the children alive and in charge. The anthology horror film is a much abused genre. At its worst it descends into a strident and often unpalatable moralism – good examples of this being tv’s Night Gallery (1969-72) and Creepshow II (1987). One of its strongest influences has been the EC horror comics of the 1950s. Unfortunately, the EC influence is one whose grisliness and rich sense of black humour filmmakers have found difficult to grasp. Amicus’s EC adaptations of the 1970s, Tales from the Crypt (1972), The Vault of Horror (1973), missed the boat altogether. Few successful examples stand out – Stephen King and George A. Romero’s Creepshow (1982), a few episodes of tv’s EC-derived Tales from the Crypt (1989-96). From a Whisper to a Scream is one of the first genuinely successful and entirely new horror anthology films, one that eschews any relieving black humour but retains the grisliness and, most of all, the viciously black O. Henry-esque twist endings of the EC originals. As is the case with any anthology, the individual episodes here vary somewhat but a consistent level of quality is present. Director Jeff Burr demonstrates a considerable surety of approach. The first episode is perhaps a routine story and its hellspawn from the grave ending fails to come off as stingingly as it should but the episode is propelled into high gear by the painfully socially maladjusted milquetoast performance from an unrecognisably made up Clu Gulager. The scenes where he works up courage to ask Megan McFarland out, her evident boredom and her disinterested rejection of him, “Don’t embarrass yourself,” have a bitingly true pain to them. Both the second and third episodes are centered around stunningly grisly endings – in the second episode, Terry Kiser being dismembered, left in a sack and then pieced back together and found to still be alive at the ending; and Ron Brooks being blown apart in a shower of razor blades and paper clips in the third episode – endings that Jeff Burr knows perfectly how to build up to and exactly when to imply more than he needs to show. The fourth story seems at times to be a far better telling of Stephen King’s Children of the Corn (1977) than the film Children of the Corn (1984) and any of its sequels was. Throughout From a Whisper to a Scream, Jeff Burr adopts a darkly gritty low key lighting scheme which, while clearly helping to disguise the low budget, also adds a darkly haunted mood to the film – and is something that often works to extraordinarily moody effect, particularly in the second episode. There are a couple of times when Burr inserts irritatingly pointless cutaway effects – flash fantasies of Megan McFarland dribbling blood from her mouth, Terry Kiser dreaming his dinghy is being attacked by underwater zombies – but not that often. The film also boasts a fine cast, particularly the heart-wrenching performance from the aforementioned Clu Gulager. Burr also obtains fine work from Harry Caesar in the second episode and from Ron Brooks in the third. 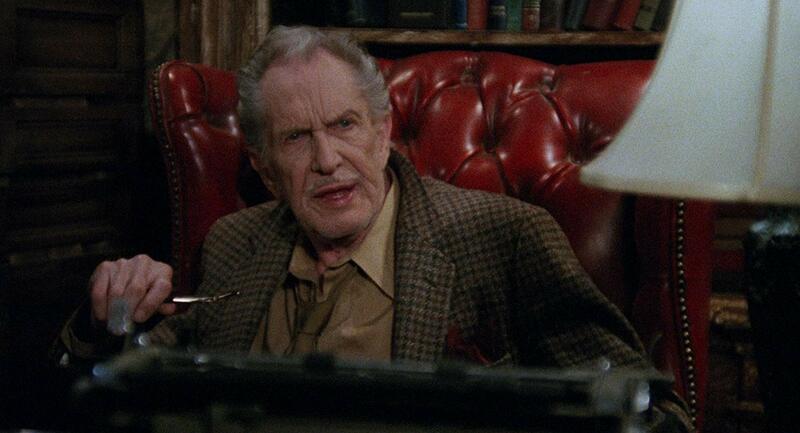 Vincent Price has never seemed more at home in a horror film than during the wraparound sequences, his fruity intonation perfectly suited to the role of a storyteller. Since his debut with From a Whisper to a Scream, Jeff Burr has stayed within the horror genre but never gone on to uphold the promise that he showed here. His other genre films include – Stepfather 2 (1989), Leatherface: Texas Chainsaw Massacre III (1990), Puppetmaster V: The Final Chapter (1994), Pumpkinhead II: Blood Wings (1994), Night of the Scarecrow (1995), Johnny Mysto, Boy Wizard (1997), Phantom Town (1998), Spoiler (1998), The Werewolf Reborn (1998), The Boy with X-Ray Eyes (1999), Straight Into Darkness (2005), Devil’s Den (2006), Mil Mascaras vs the Aztec Mummy (2007), Resurrection (2010), Gun of the Black Sun (2011) and Alien Tornado (2012).